Rainforests are very rich in natural resources, but they are also very fragile. For this reason, indigenous people have become instinctive conservationists. For them, conservation is literally a way of life. Their way of life has gone on uninterrupted for centuries, but is now under threat because of the invasion of the rainforest by outsiders - logging companies, mining operations and ranchers looking to make a quick profit by exploiting the natural resources to be found in the rain forests around the world. When you think of endangered species, you tend to think of animals or plants. It would be fair however to describe indigenous people as endangered. Each tribe is unique, has its own language, culture, mythology, religious beliefs, art and ritual. There is undoubtedly a great deal we can learn from them. We know already that there are a vast number of as yet undiscovered plants and animals in the rain forest. Tribal medicine men may hold in their heads the key to curing many of the world's as yet incurable diseases by using undocumented chemical compounds found in species of rain forest plants. What is more, the tribes have been able to live in the forests while causing minimal damage to them - something that we seem incapapble of doing. Even more frustrating is the knowledge that rainforest soil is very poor for growing crops and can turn to virtual desert within five to seven years of losing its protective canopy of trees and the anchoring effects of tree roots, with the topsoil washed away in the rains. Governments know this, yet still allow logging and ranching to continue on a huge scale. It is true that in the short term, huge amounts of money can be made from exploiting the rain forest in this way. But in the longer term - perhaps in as little as ten years -there will simply be vast areas of desert where once there was rain forest. Let us turn now to the fortunes of possibly the most famous of all the tribes of the rainforest, the Yanomami Indians of northern Brazil and southern Venezuela. 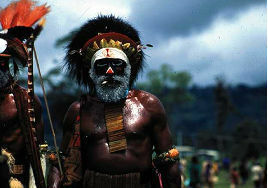 By looking at this one example in detail, we can examine the problems which face indigenous people all over the world.